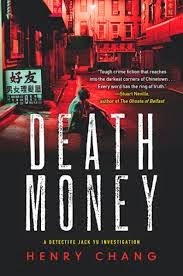 I like Henry Chang's series featuring NYPD Detective Jack Yu more and more as it goes along (Death Money is the fourth). I don't know if I'm just getting used to the Chinatown elements (including some supernatural aspects, in particular Jack's consultations with an elderly clairvoyant), but the milieu is more and more natural and believable, and Jack is certainly totally embedded in it. I usually deal with non-U.S. noir fiction here, but Jack's Chinatown is pretty much not the U.S., in several ways. The customs and gangs of the district have more to do with towns from which the residents (or their forebears) came than with the other neighborhoods around Canal Street (or even the non-Chinese denizens of Chinatown proper). This is not the Chinese-America of the dragon parade or the fortune cookie. In Death Money, Jack is called outside his district to investigate a floating corpse (because the body is Asian, and Jack is the department's go-to Chinese officer). As he digs into the immediate uptown neighborhood's Chinese restaurants and their Chinese gang connections, a picture emerges of the continuing realities of immigration from China and Jack's own particular Chinese-American life. When he delves into the ladder of power in the gangs, he reaches the sad heart of this and most noir fiction: unhappy families. Chang's writing is clear and fluid, without padding or melodramatics, and though there are ongoing plot elements (including the sad state of Jack's love life) across the series, it's easy to pick up the story with any of the books if you can't start with the first one. Jack's saga is compelling and non-formulaic crime fiction, but also a glimpse into the closed world of an Asian diaspora.